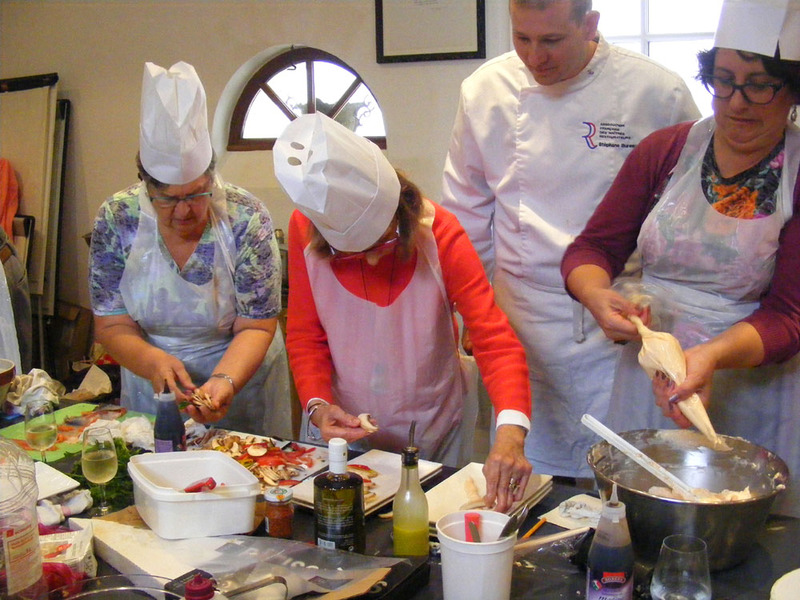 Last Wednesday was the last Loire Valley Cake Club for 2017. It was a very pleasant gathering at Gaynor and TimB's, with 11 in attendance. The weather behaved so were able to sit outside in the sun, have a glass or two of rehydration, and then get stuck in into the food. 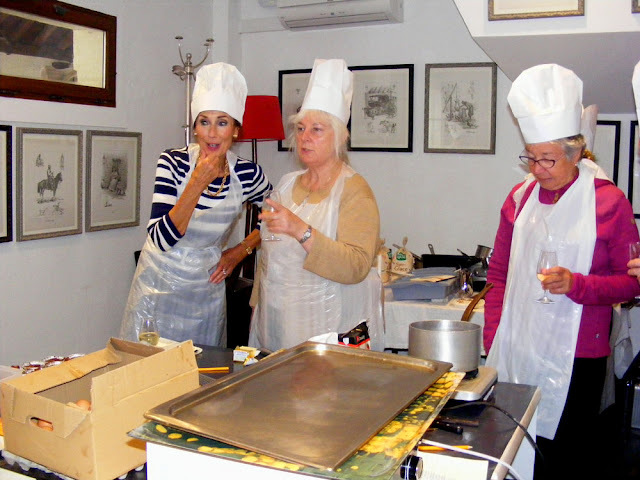 This month was a "Lucky Dip" event, so anything cooked in the oven qualified. 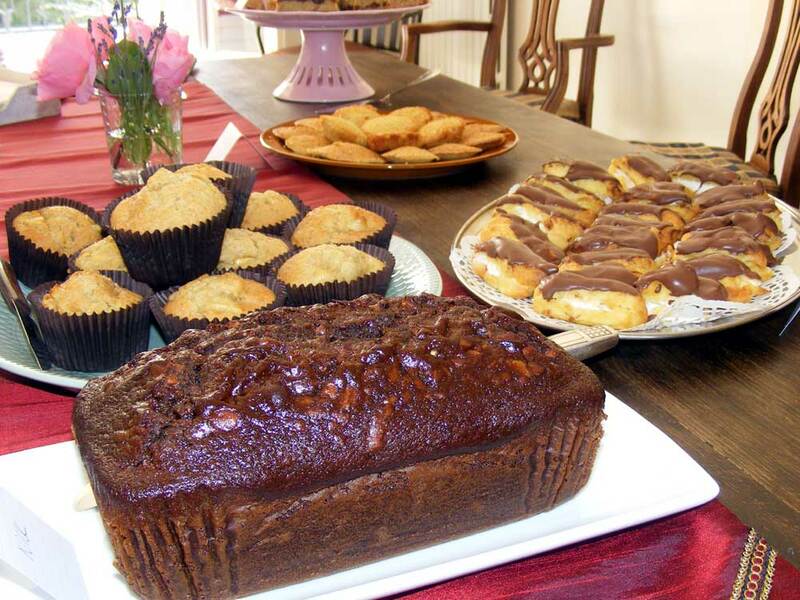 Thus we had sausage rolls, quiche, madeleines, muffins, flapjacks, sticky ginger cake, eclairs and meringues, a nice mixture and not a diabetes inducing bloatfest that a bigger gathering can become. All in all, an excellent way to spend an afternoon, and we hope they continue for as long as we have an appetite for cake. Oops - almopst forgot. There wasn't a raffle this month, but Jean had bought along a cake stand to be taken away. Thus we wrote our names on a piece of paper, popped it into the proverbial hat (a tin) and drew out Simon's name. Yay! In Monday I wrote about Ste Clotilde, and mentioned that there were many lurid tales about her in the 10 part "History of the Franks" by Gregory of Tours. 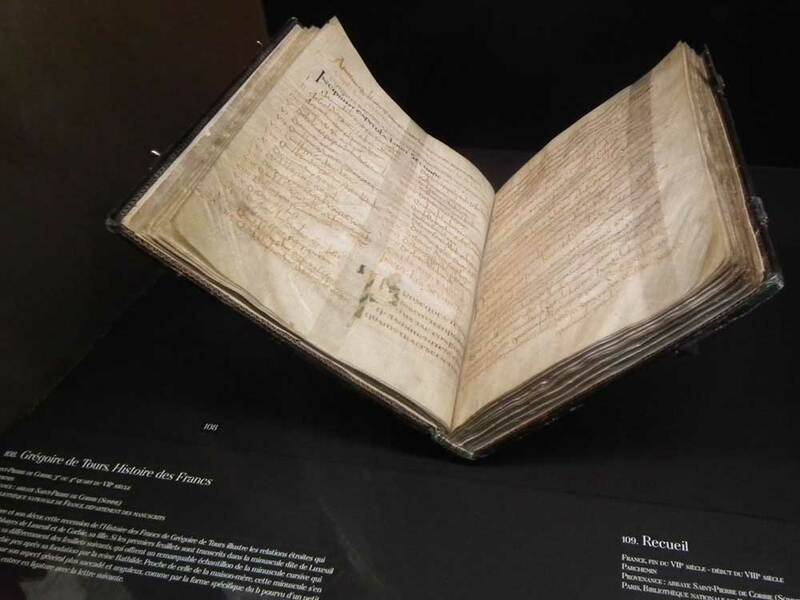 When we were in Paris in February this year we visited the Cluny Museum, which had a special exhibition of Merovingian items, including an 8th century copy of one of the books of "The History of the Franks". My Latin isn't good enough to be able to tell you what page this was open at, but it is amazing that such a thing still exists. 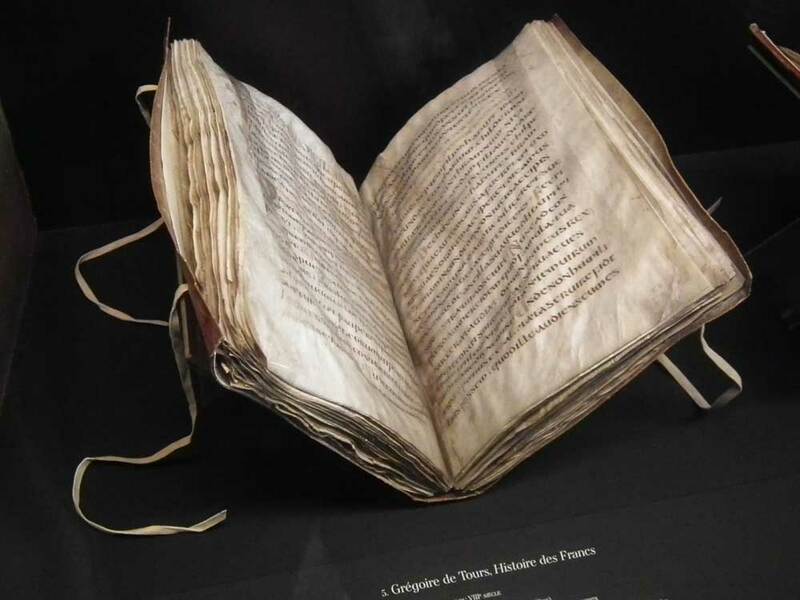 Even more amazingly, there was a 7th century copy of the book (3rd or 4th quarter), which means that it was produced less than 100 years after Gregory's death. Of course, just because it was produced so close to Gregory's death doesn't mean that it is any more accurate in its history, but it does mean that it is closer to the story that Gregory wrote. It has to be remembered that he had to be very careful about displeasing his temporal master, who happened to be the Frankish king. Tours was on the border of the two parts of modern France - the Frankish north, and the more Roman south, so he heard plenty of stories which he appears to have used to illustrate the benefits of Roman Catholic clean living, rather than being totally empirical. It is through Gregory that we "know" so many things about the Merovingians, but the quality of the art and literature the Merovingians left behind would tend to make a lie of the impression Gregory gives that they were an unruleable rabble. It may be that the stories of the Merovingians are there to contrast the virtues of being a good, Roman Catholic king, as opposed to the Pagan, Jewish or even (gasp) Arianist Christian subjects. Stéphane doing something cheffy with a tomato. 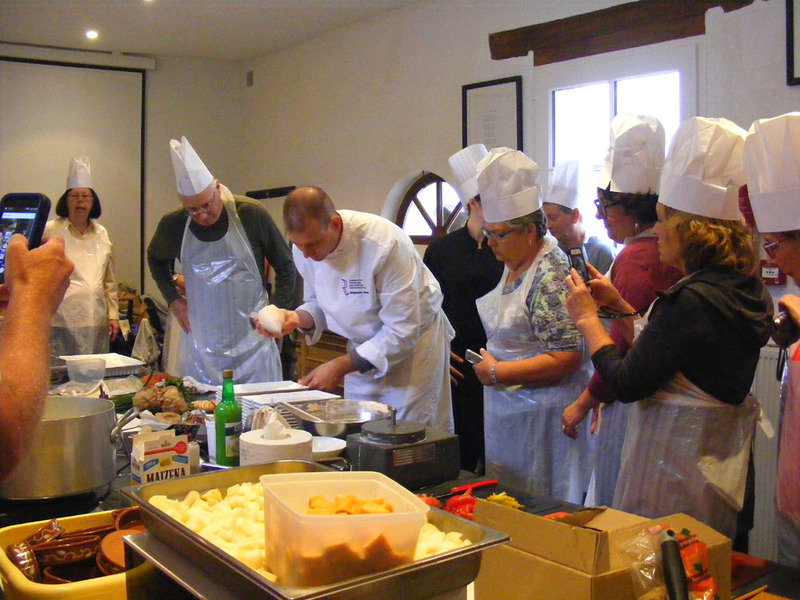 As part of my week spent guiding a group of American gardeners around the Loire Valley I got the opportunity to attend a cooking class with the chef at the Hotel Clos d'Amboise, Stéphane Bureau. Deb Flanders, from Goodspeed and Bach, who organised the tour, has traditionally included a cooking class in the tours with Charlie Nardozzi, and this was no exception. The only photo I have with Cédric in it! He's the dark haired guy reaching across the table. 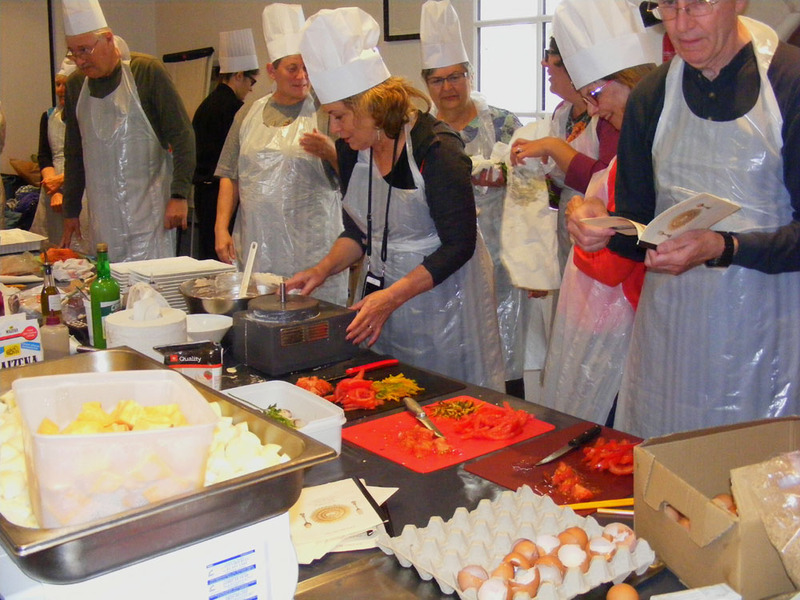 Finding somewhere that would take a group of more than 10 people for a cooking class was really difficult. Deb and I exchanged ideas and emails for months before Stéphane said he would do it. Luckily for us, he has been wanting to start doing classes for the public since the beginning of the year and now had got permission from the management. A proud julienner shows of her handiwork. He very sensibly designed a menu that would give everyone something to do, from those who were experienced and wanted a challenge, to those who needed the basics. He also very sensibly invited his sous-chef Cédric to join us. Stéphane's English is hesitant and his vocabulary limited. Cédric has worked in Ireland, Australia and New Zealand, so his English is excellent, and he and I provided translation services. 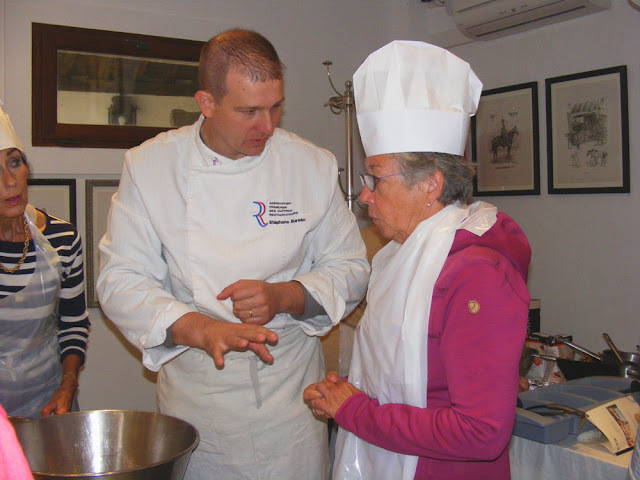 Chef and student concentrating on giving and receiving instructions for the pudding. 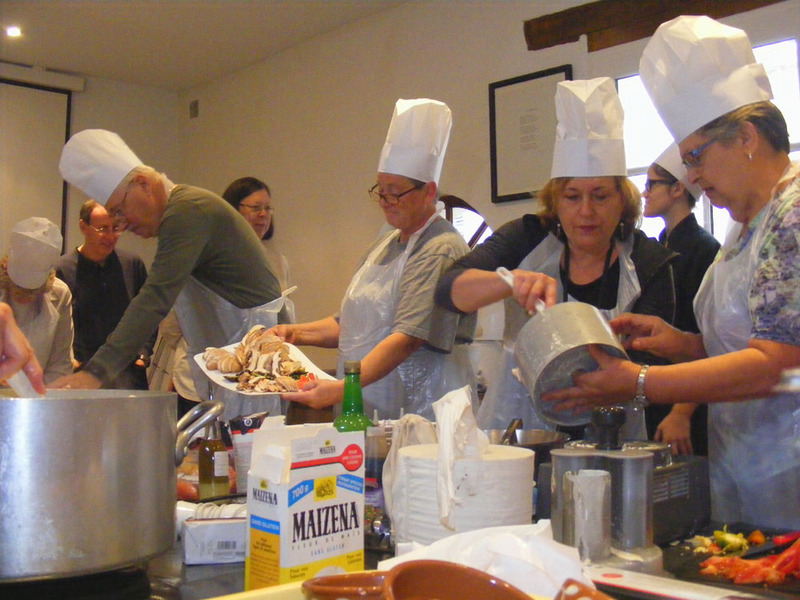 Over the course of two hours we made Salmon Mousse, Hazelnut Crusted Chicken with Sainte Maure and Vegetable Gratin, followed by Squidgy Chocolate Pudding. Then we got to eat it for lunch. 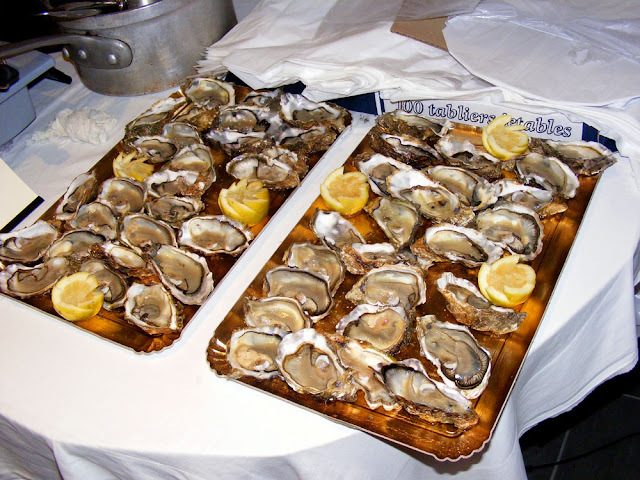 At the half way point we took a break for oysters and white wine from Chateau de la Presle, who are neighbours of Stéphane. Oysters from the market, prepared by the apprentice chef. The teaching kitchen was jam packed with equipment temporarily set up and 25 people. 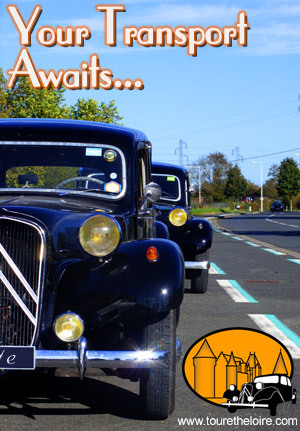 In that very French way it seemed like utter chaos to begin with, as Stéphane gradually made his way around the room, explaining to everyone their particular tasks. The group was broken up into four smaller teams, each of whom got to work on a dish. I sort of hovered mostly between veggies and pudding. 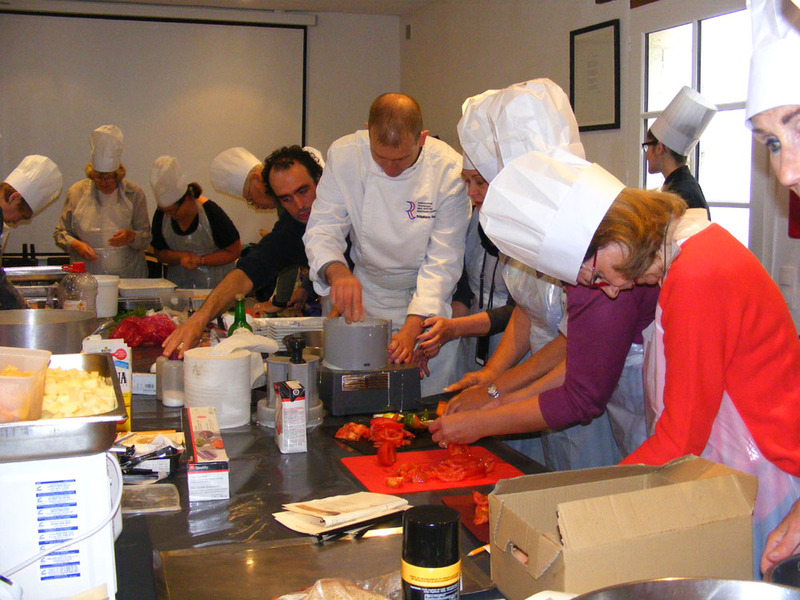 After a short while everybody was concentrating and it all came together. We produced a tasty meal with very little fuss and bother. Getting ready to plate up the starter. 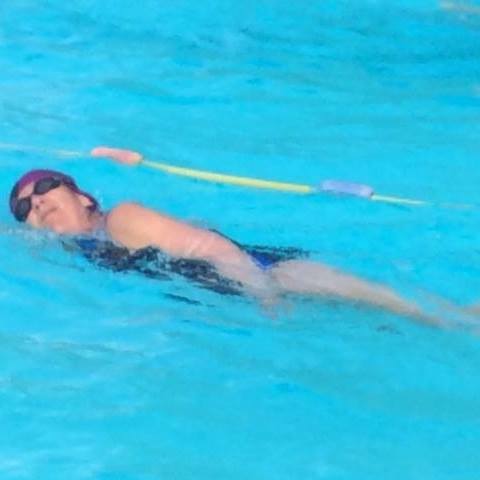 Despite us being his first class, Stéphane was a model of calm and relaxed instruction -- or so we thought. The receptionist later let slip that he was in fact very nervous. 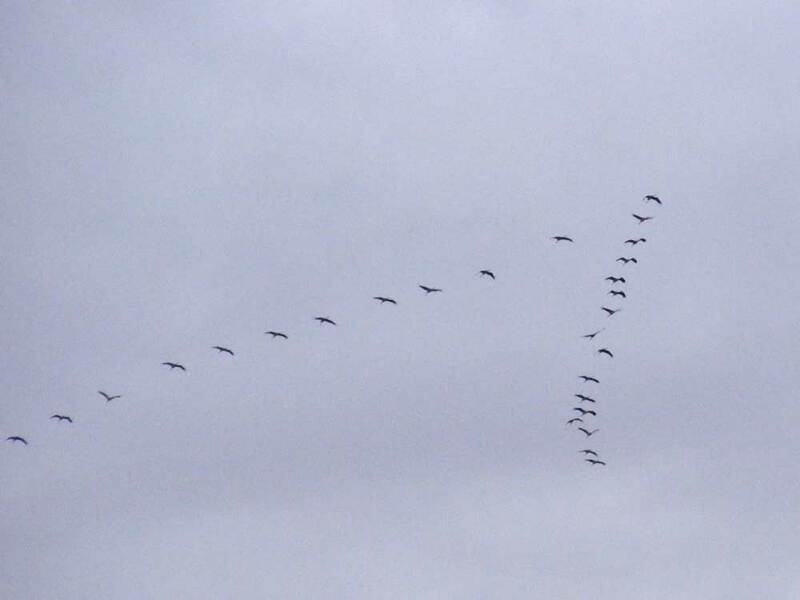 It didn't help that we were such a large group. He had another, smaller, group scheduled for a few days later, and was relieved when our group went so well. The next group will benefit from some tweaks to solve minor issues that were revealed by our class. Stéphane demonstrates piping the salmon mousse. 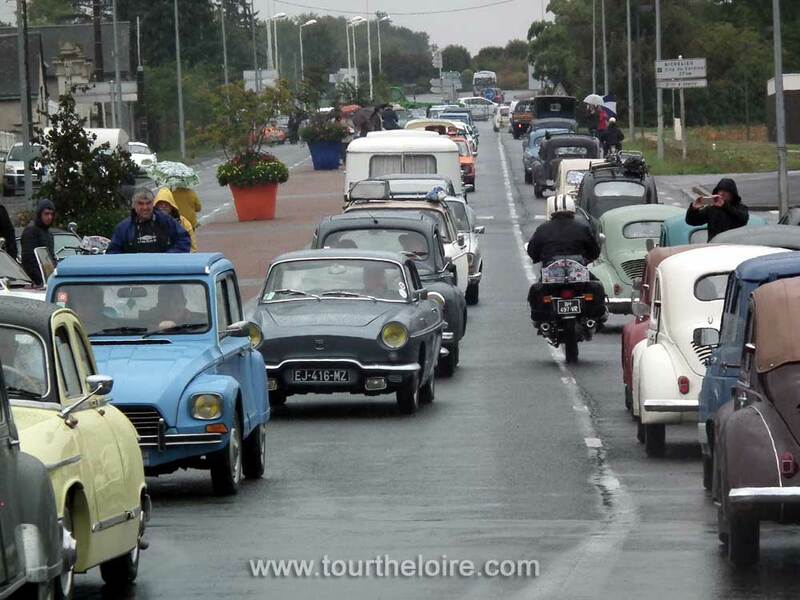 All in all a fun and convivial way to spend a morning in Amboise. 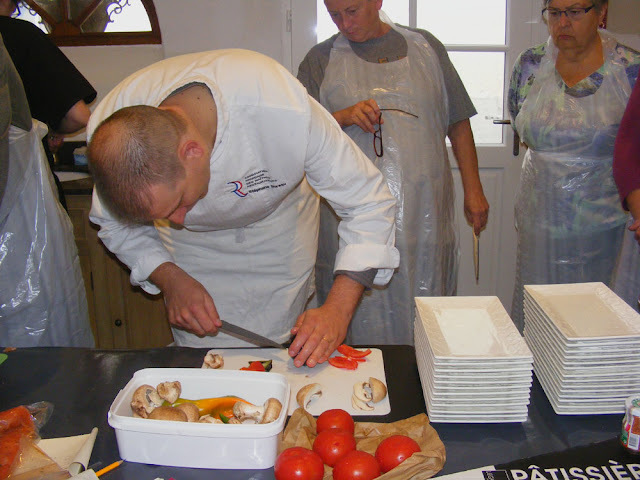 Dressing the salmon mousse with julienned vegetables. Nothing left to do except wait for the caramel to boil. A week and a half ago were the journées européennes du patrimoine. 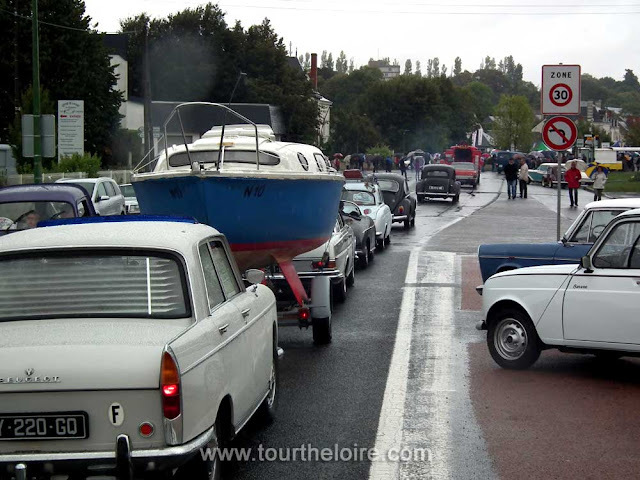 I took part in the heritage traffic jam on the Sunday, and didn't do much more. 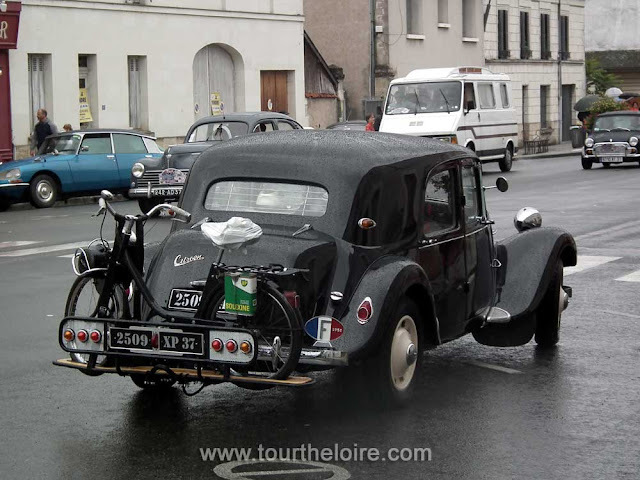 However, we expected the steam train R.840, one of only a few in France, to make an appearance in Loches soon after the traffic jam finished so we hied our way from Ste Maure to Loches in anticipation. OK, brain surgery is a bit of an exaggeration, but I did have surgery on my scalp the other day. For many years I have had two cysts on my scalp. One of them was a nuisance for years because it was right where I kept sticking it with pins if I did my hair in a certain way. Then the other one got large enough that it became visible as a sort of roll in my hair and began to ache when I lay on it in bed, and it made wearing a hat or putting my sunglasses on my head uncomfortable. Time to get them removed. The dermatologist took one look at them and said they definitely needed to be dealt with, but that it would be day surgery and she wouldn't need to shave my head. She told me that they were hereditary, and it turns out that my father has similar lumps on his scalp. Simon drove me to Le Blanc, which is where our dermatologist is based. He asked if I wanted him to come in with me. He didn't really want to because he was a bit squeamish, but I asked him if he would. Just as well, because although I was looking forward to getting rid of the things, I must have been a bit stressed. The doctor asked me three times if I had washed my hair that morning or the day before. The words, in French, just didn't compute. I was fine with 'have you ever had cysts like this removed before' and various other preliminary questions, but for some reason 'did you wash your hair today' was just noises. Luckily Simon understood and translated. Having had various medical treatments in France now, I would say it is always a good idea to have someone else along, as brain freeze seems to be quite common. 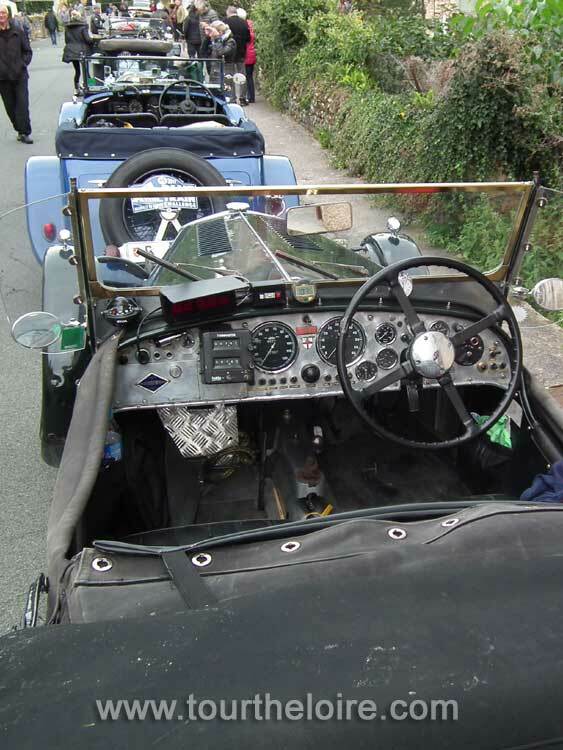 Simon suffered from it a couple of times when he was being treated for his detached retina. The doctor injected a local anaesthetic and used sticky tape to hold my hair out of the way. This caused a good deal of oh la la-ing and 'it's like the pelt of an animal!' I have long thick hair and I think she might have regretted saying she wouldn't shave patches. Then she cut the cyst open, squeezed like mad, poked, scraped and prodded for quite a while, cauterised some veins (burning some hair in the process), cleaned it up, sprayed on an antiseptic and finally put in some stitches. The process was repeated for the second cyst. Simon said he was surprised how much blood there was. I got a finger wagging about leaving it too long to have them dealt with. Next time, she said, don't let them get beyond hazelnut size (they were about 3cm long and 2cm wide). They are much easier to remove if they are small. I got a prescription for some swabs and some antiseptic spray and told to apply the spray twice a day, then once a day until going to the nurse to have the stitches out a week later. I wasn't allowed to wash my hair for two days either. The local anaesthetic wore off fairly quickly, and the wound on the side of my head really throbbed. I took some painkillers when I got home and that improved it, but I was uncomfortable and a bit miserable for the rest of the day. I was too scared to put my hair up again and just gently tied a scarf around my head. The doctor did a good job though. No one seeing me in the street would have been able to tell where the dermatologist had been at work. The operation cost €111, which she tells me will all be reimbursed. The Jardin du Luxembourg has statues of 20 French Queens and Illustrious Women. The subjects were chosen by Louis-Philippe I in 1843. 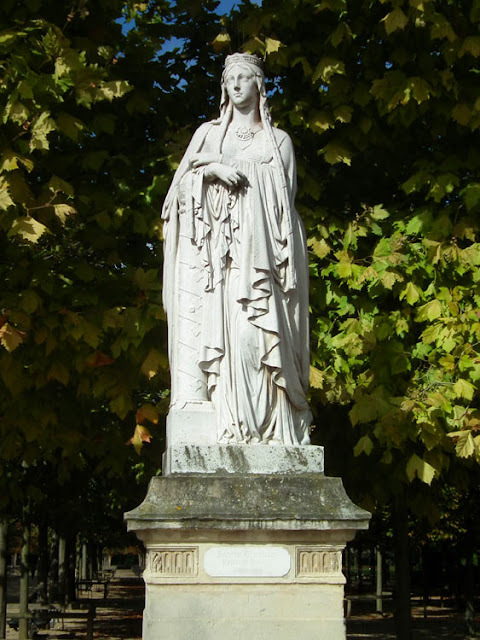 Ste Clotilde (475?–545) was the second wife of Clovis 1, first king of all the Franks, and was responsible for him converting to Christianity (particularly to Catholic Christianity rather than Arianism, which would have been the most likely course). She is the subject of a number lurid tales, including from Gregory of Tours (538?-594) in his epic 10 book Historia Francorum (History of the Franks). After Clovis died (511) she did the nun thing, and went to the Abbey of St. Martin at Tours. You can read more about her here, and to be in her statue like presence you have to go here. This statue was created by Jean-Baptiste-Jules Klagmann in 1847. 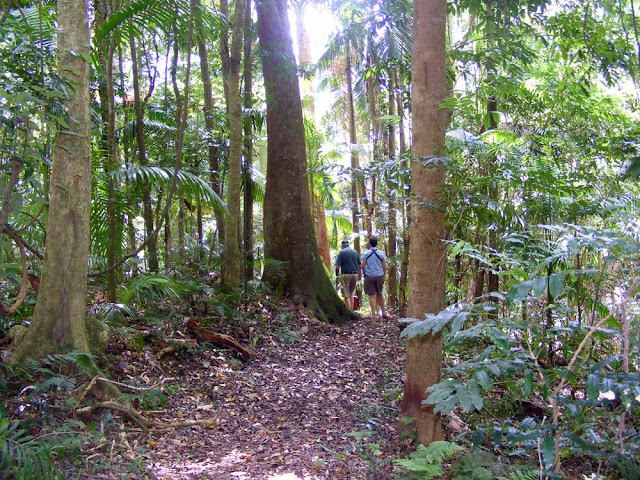 Some views of Ravensbourne National Park in south-east Queensland. 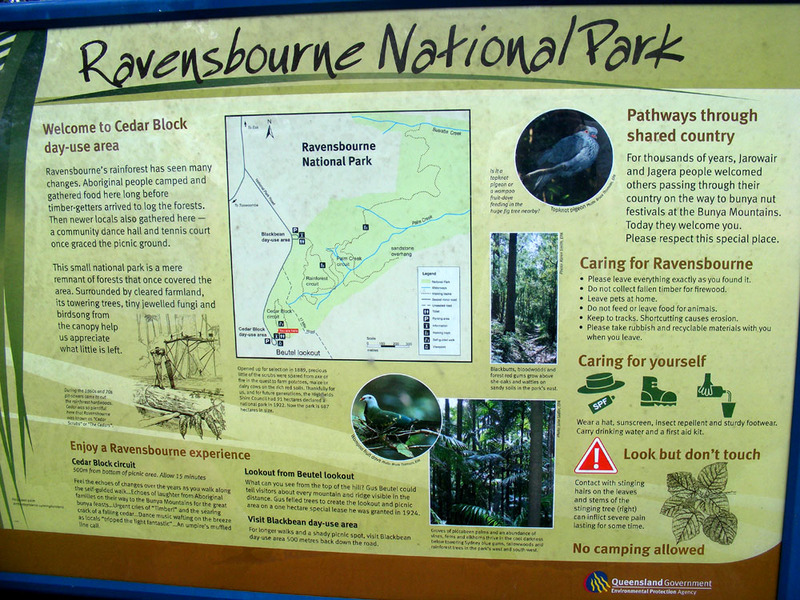 Ravensbourne National Park is about 20 kilometres from Toowoomba. 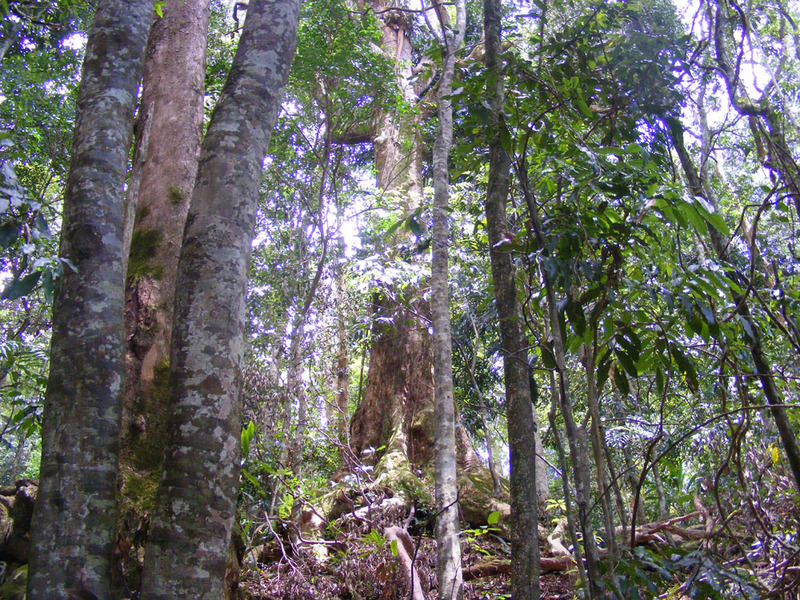 It has some remnant old growth trees of great size, palms, gullies with small streams and some species of birds that you don't commonly see, such as Black-breasted Buttonquail, Green Catbird and Noisy Pitta (110 species in total). 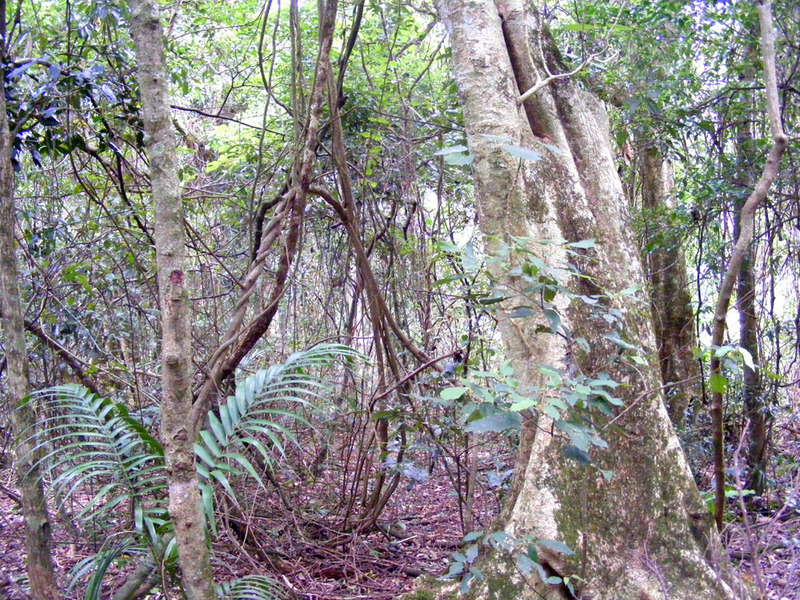 You might also catch a glimpse of native frogs and lizards. Ravensbourne NP is the best surviving section of the once vast rainforest and wet eucalypt forest that covered this part of the Great Dividing Range until European settlement. The local Aboriginals used the area as a stage on their journey to the Bunya Mountains, where they would harvest the important food source of Bunya nuts from the Araucaria bidwillii. 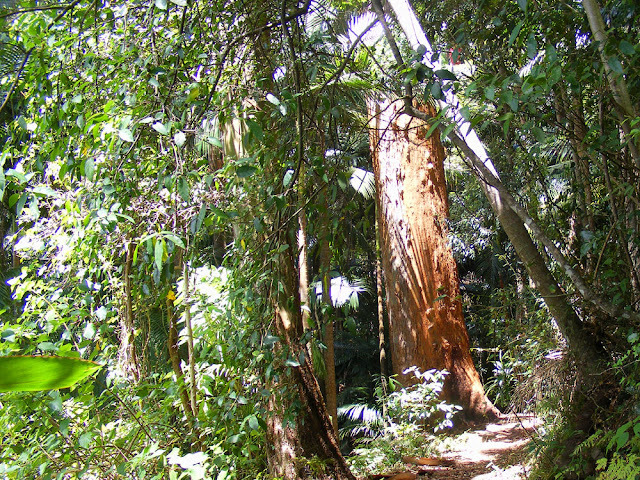 In the second half of the 19th century most of the big hardwood trees, especially Red Cedar Toona ciliata, were felled. Nowadays, apart from the remnant giants, the star plants are the palms and the ferns (including elkhorns). The fungi are also notable. 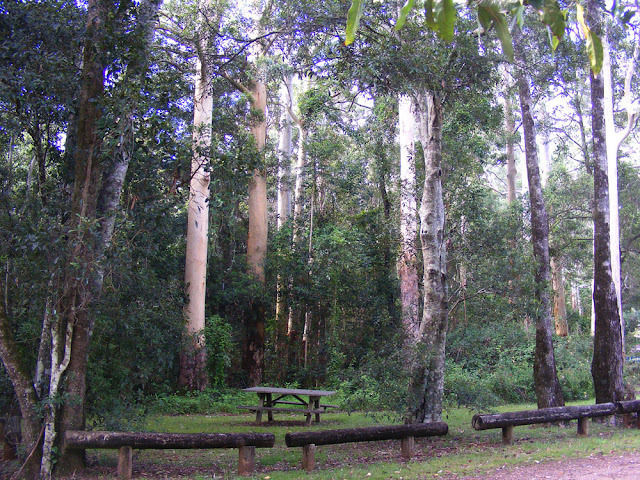 Camping in the National Park is not permitted, but it is a popular picnicking spot with a panoramic lookout. Bushwalkers and birdwatchers also take advantage of how close it is to Toowoomba. Shelter sheds and picnic tables are provided at two areas, as well as pit toilets, water and wood barbecues. The water is not potable so you are advised to bring your own or boil the water on site. Likewise, firewood is not provided, so if you want to barbecue you need to bring your own fuel (collecting wood in the National Park is understandably forbidden). There are no rubbish bins and visitors are expected to take their own rubbish out. Domestic animals are banned from the park. Some of the tracks have steep drop-offs and can be slippery after rain. 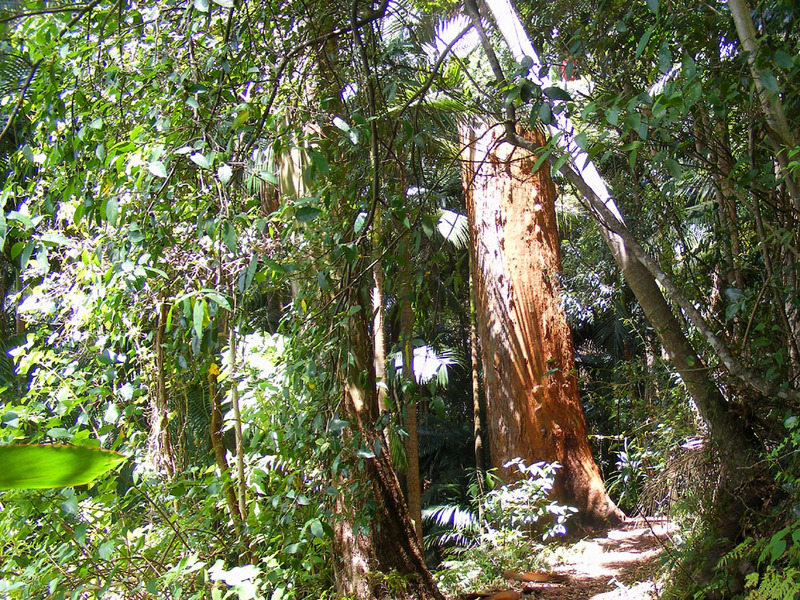 Visitors need to be careful of the stinging trees. 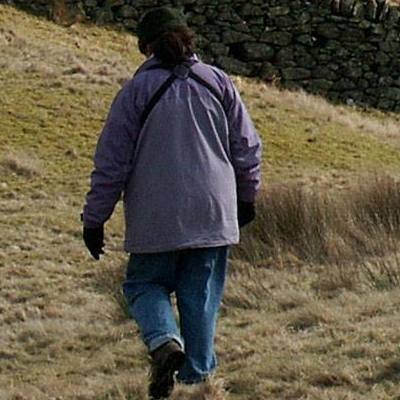 Mobile phone coverage is patchy so you need to fairly self-reliant. 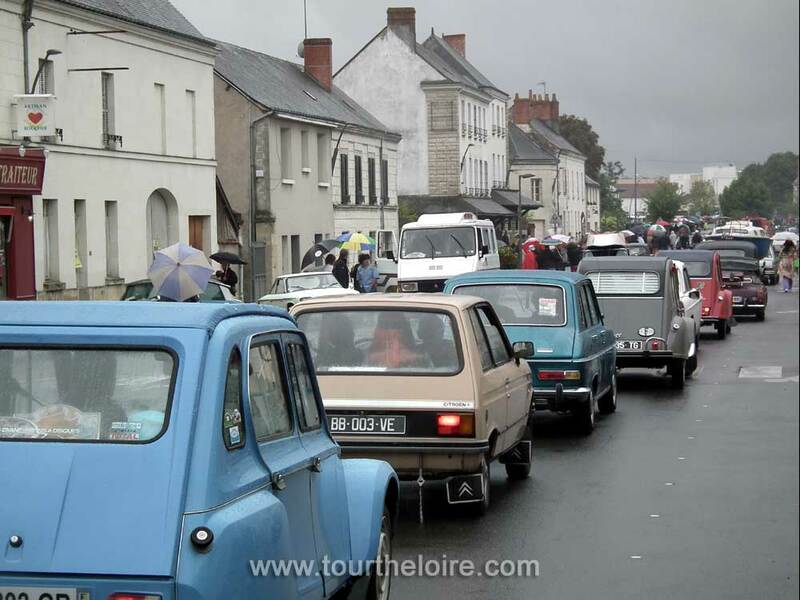 The weekend of 16-17 September was the annual Journées du Patrimoine (Heritage Days) in Europe. 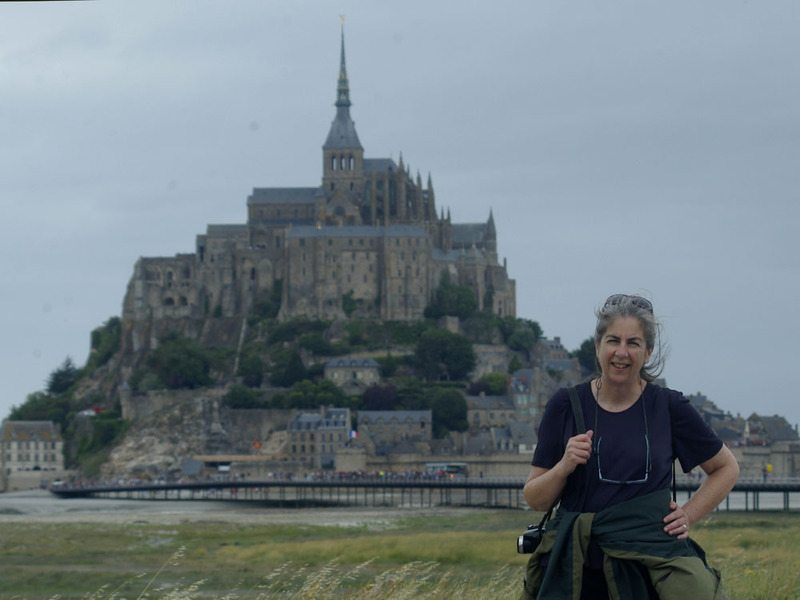 I was in Amboise working with a group of American gardeners for a week but I had Sunday afternoon off. I chose to visit the newly restored Chateau Gaillard at a reduced entry fee, with my two American colleagues. The facade of the royal apartments. Chateau Gaillard is a small royal chateau in Amboise, used by Charles VIII as a retreat when he returned from the First Italian Wars. 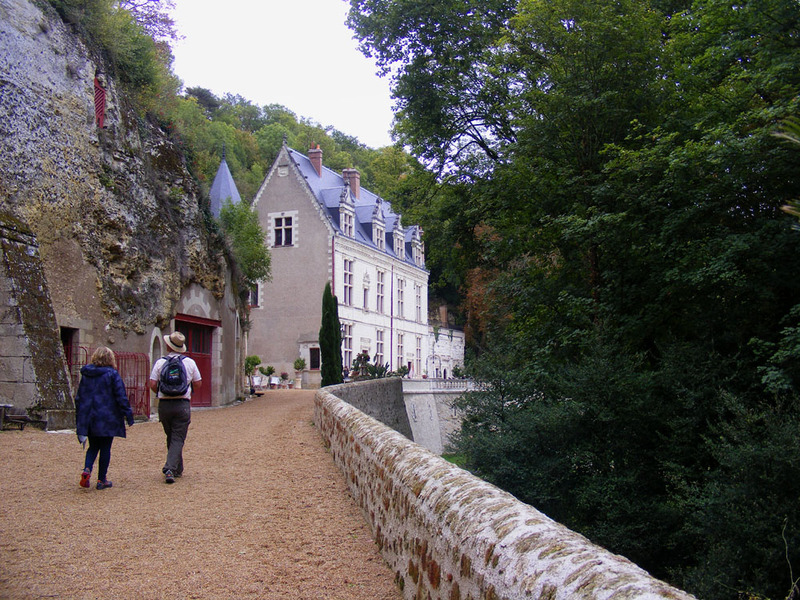 It is just up the road from Clos Lucé and tucked in under the southern cliff face of the limestone spur that the Chateau-Royal of Amboise sits upon. This hexagonal staircase tower gives the building away as late medieval rather than wholly renaissance in style. 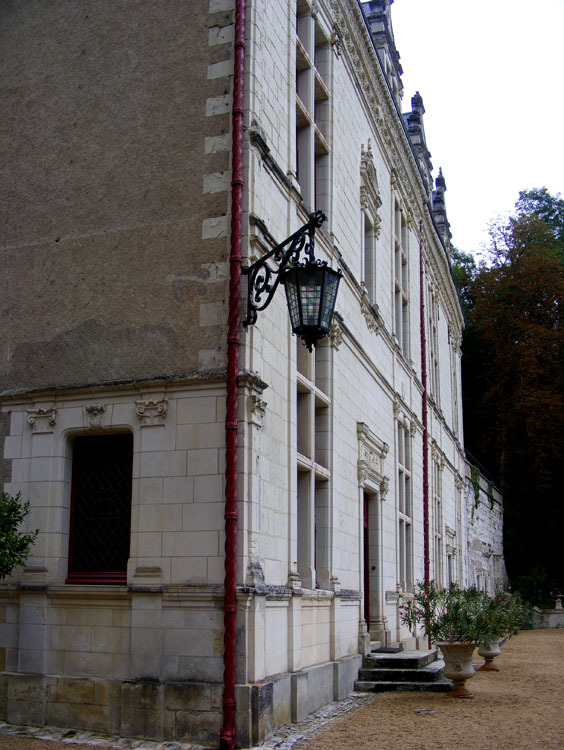 Construction of the royal apartments which form the main block of the chateau began in 1496. It is the first building in France to be built in the Italian style that the Loire Valley chateaux are famous for. 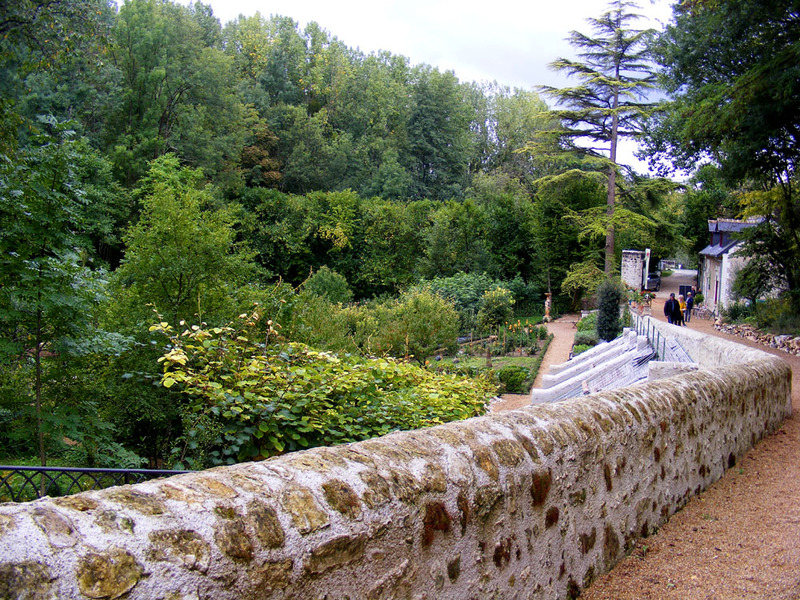 It is also the site of the first renaissance style garden in France, with Italian style parterres that become the iconic French formal style of gardening. The kennels turned out to currently house a small goat. In front of the chateau is a generous terrace which looks out onto a 15 hectare park which has been created on boggy land on the banks of the Amasse. 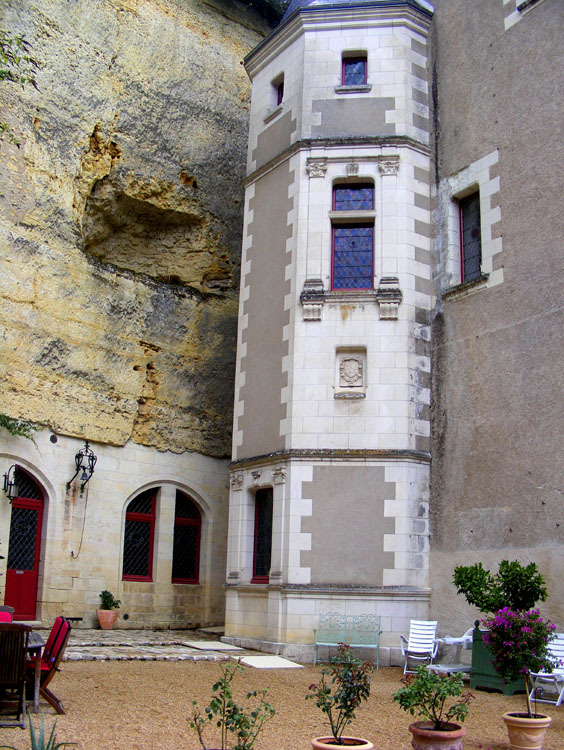 The 20 metre cliff behind the chateau means that the valley bowl is protected from the north winds and has its own Mediterannean microclimate. 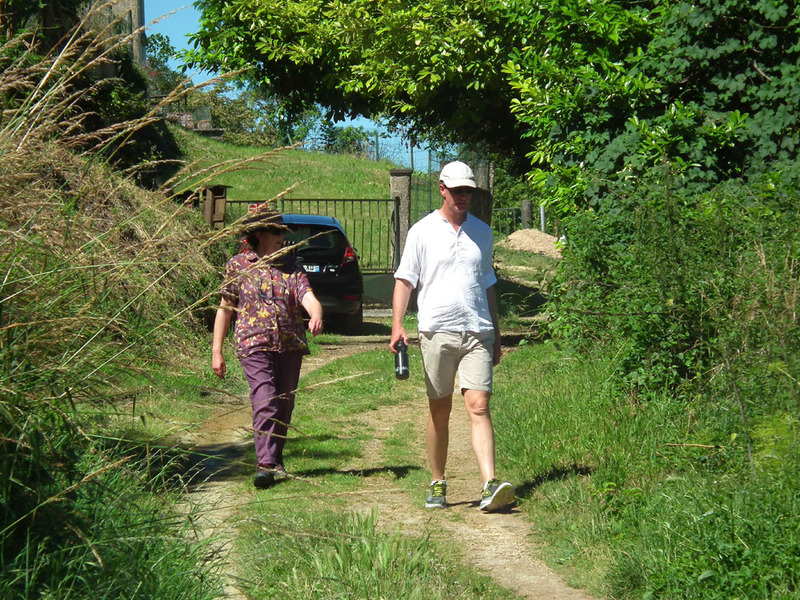 My American colleagues Deb and Charlie walk up the driveway. The original garden was created by Dom Pacello da Mercoliano, who returned with Charles VIII after his campaigning in Italy, along with a team of 21 other Italian artisans. 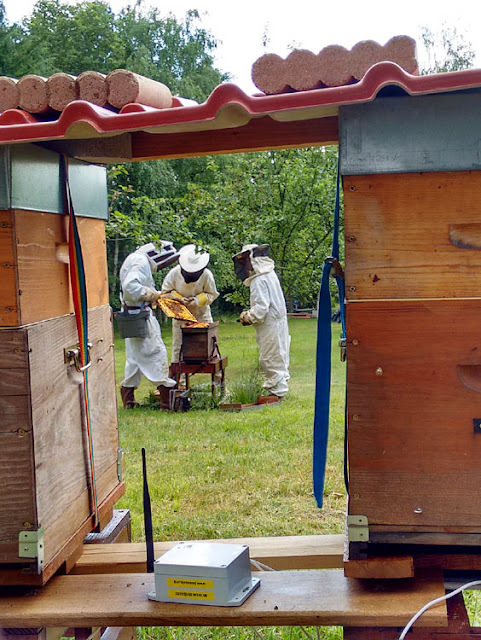 The site provided ideal conditions, with plentiful water and shelter, that gave it a big advantage over the main Chateau-Royal. Looking down into the kitchen garden. Dom Pacello created the first garden in France with a central axis to enhance perspective, the first formal garden beds, defined by low holly hedges, and the first 'mirror pond', fed by the Amasse and a spring on the side of the hill. He introduced citrus, especially lemon and orange trees, to the garden, the very first to come to France. 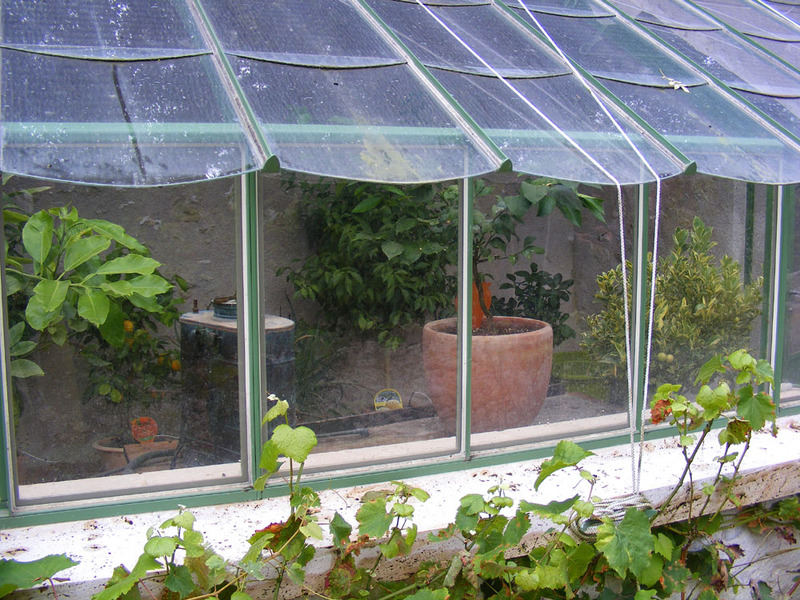 Heated greenhouses were built to house the northern most peaches in France. The greengage plum (Fr. reine-claude) dates from Dom Pacello's time here and was a selection made in this garden. Another innovation was the growing of melons and tomatoes in enclosures with low walls to act as windbreaks. 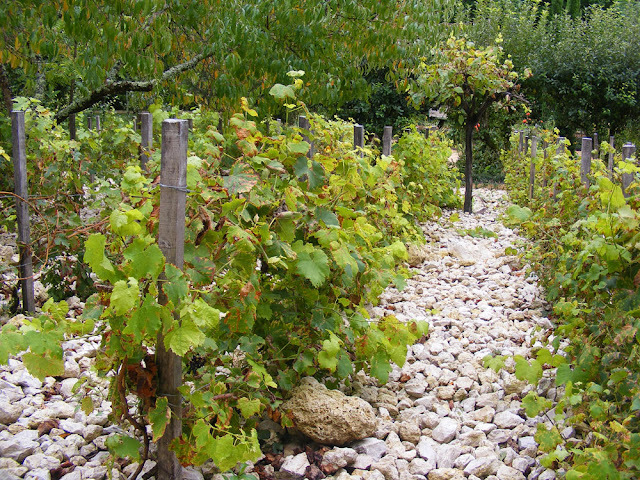 Different local wine grape varieties grown on a south-east facing slope, with chunks of limestone mulch. Nowadays in the park there are many grand trees (oaks, cedars, yews, tulip trees, elms, ash, robinia, Judas trees), an arched gateway contemporary with the chateau, an 18th century cottage, grottoes in the cliff as well as a magnificent 350 metre double allée of London Plane forming the 'back' driveway, created in 1885 by Jean Théodore Coupier (industrial chemist and engineer, a former owner of the chateau). In 1505 Louis XII ceded the chateau to Dom Pacello, in return for a rent of 30 sols and a bunch of orange blossom every year. After having been one of the residences of Charles VIII and Anne of Brittany, then Louis XII and Dom Pacello, Chateau Gaillard saw a succession of notables stay within its walls: René de Savoie (François I's uncle) and Anne Lascaris ; Jean III Cardinal de Lorraine; François II and Mary Queen of Scots (on their honeymoon); Charles de Guise-Lorraine (Jean's nephew and also Cardinal, who remodelled the facade of the royal apartments in 1559); René de Villequier (one of Henri III's favourites); the Della Rovere family (Italian nobility whose family included two Popes and the Dukes of Urbino); and André Malraux (de Gaulle's Minister of Cultural Affairs) and Louise de Vilmorin (his mistress, a novelist and heiress to the Vilmorin seed company fortune). The estate is currently owned by a private property trust headed by Marc Lelandais. 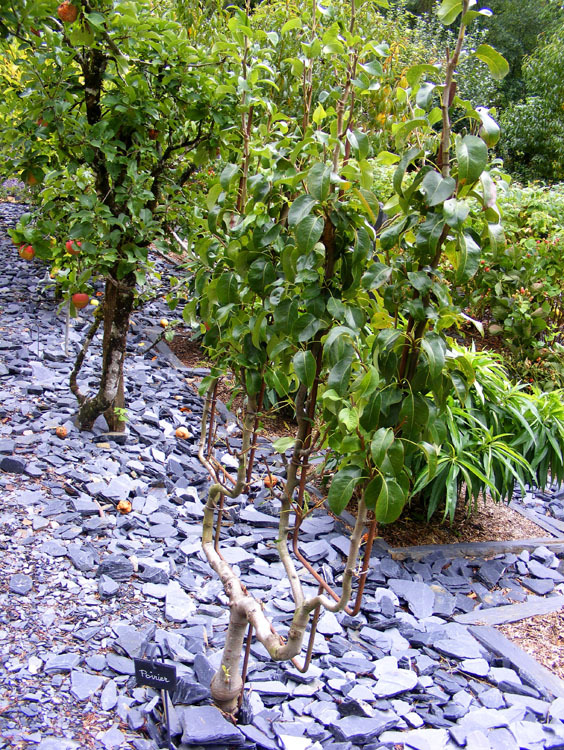 Espaliered apple trees with chunks of slate used to define the beds and mulch. 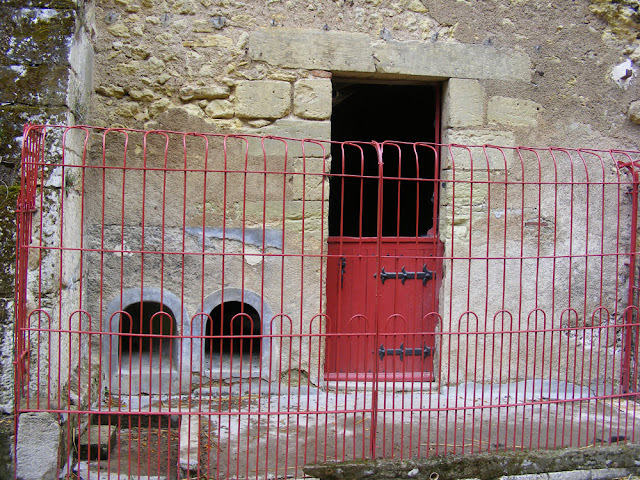 In 2009 the chateau was a ruin and it seemed possible that the site would be subdivided. Luckily the mayor of Amboise refused to authorise this and Marc Lelandais was able to purchase the property with a view to restoring it to its former glory. 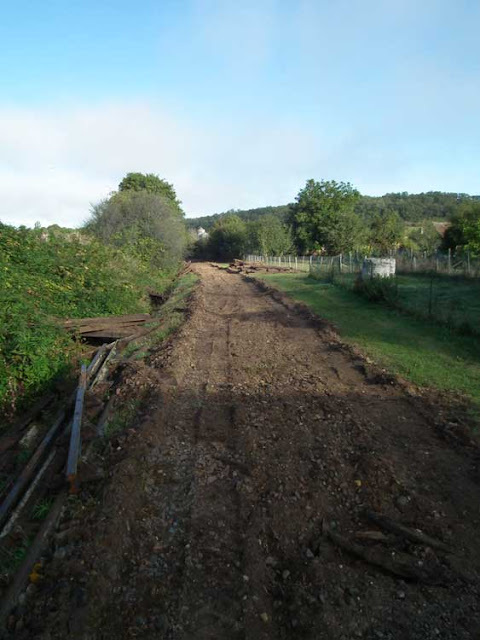 Using private funds only, it took five years, and just as they were about to open fully to the public, in June 2016, they were inundated with flood waters. and in two months this. And then suddenly it will be February, we will have a week of sunny warm weather, and everyone will be saying "isn't it amazing, winter's over early". The Calais-Méditerranée Express was a luxury French night express train which carried wealthy passengers between Calais and the French Riviera from 1922 until 1938. 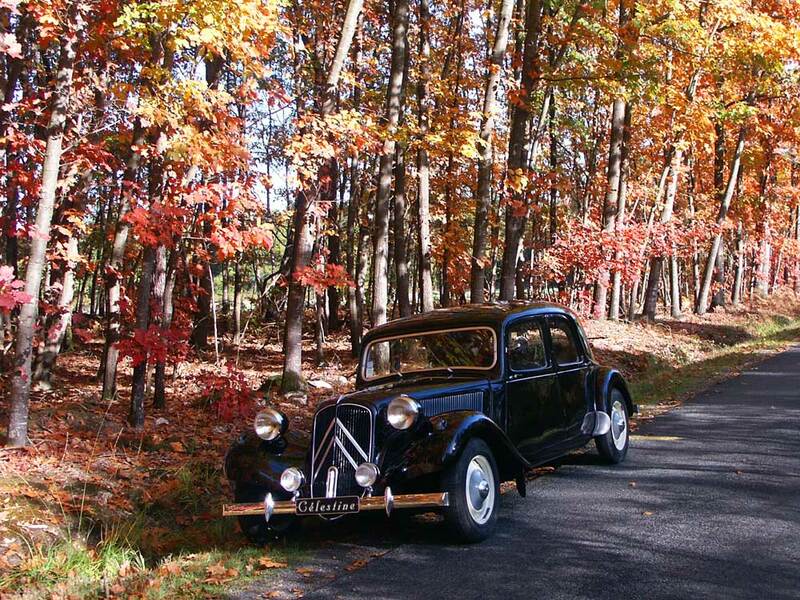 It was referred to as "le train bleu" in French and the Blue Train in English because of its dark blue sleeping cars. 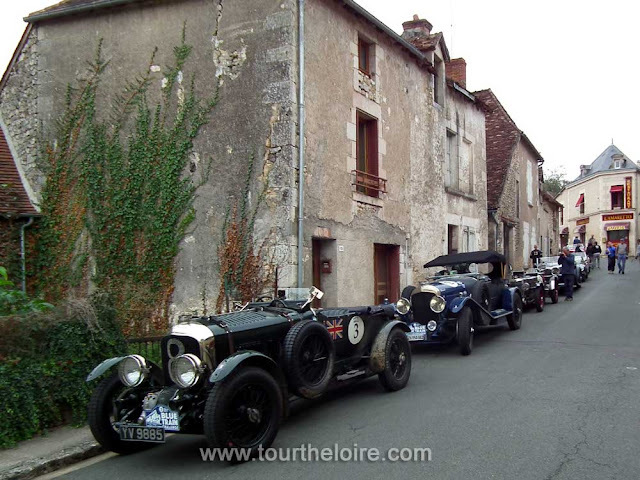 In 1930 a very unofficial race was held between a Rover car and the train. 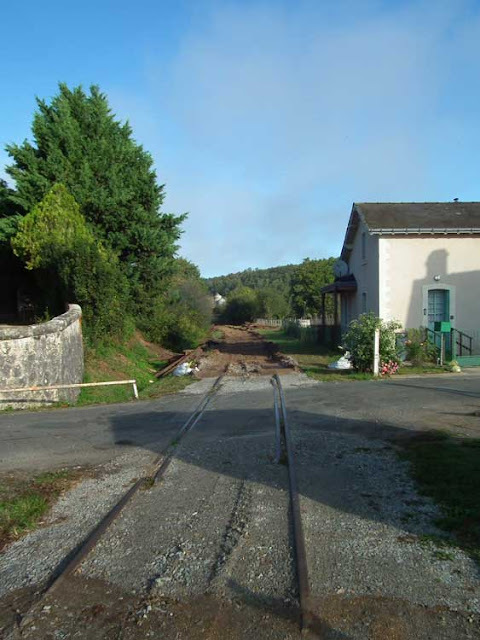 Although the car was stopped by heavy fog 5 hours into the run, the team decided to drive on to St Raphael (near Cannes, on the Mediterranean coast) and race the train back. 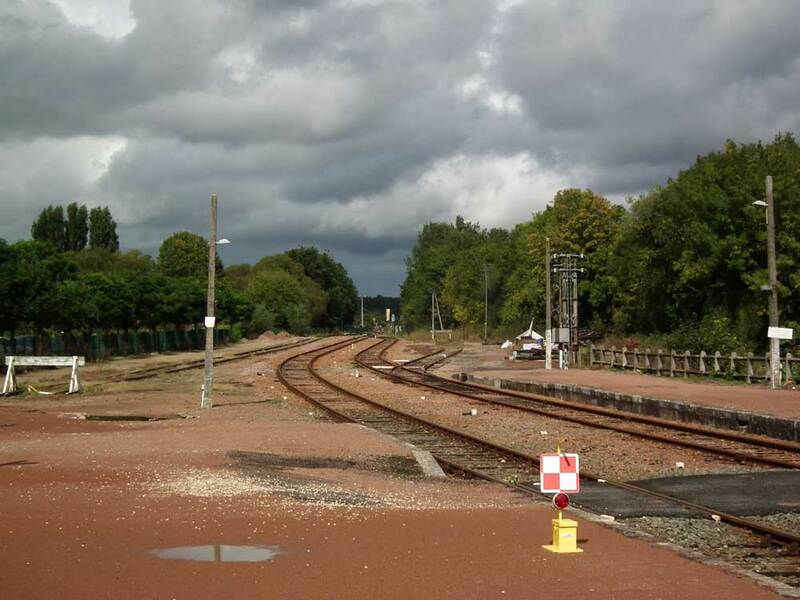 This they were able to do, beating the train into Calais by 20 minutes. After that there were a number of other "races" notably involving Bentleys and Alvis cars. 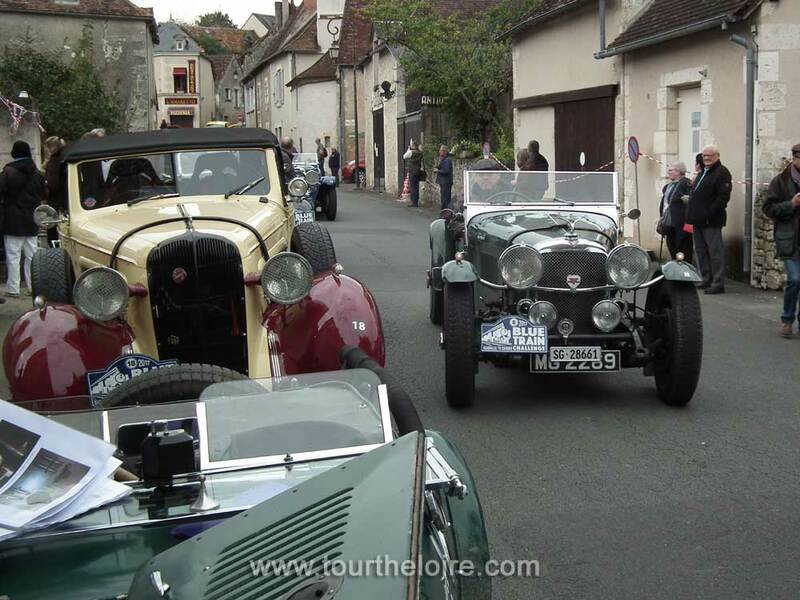 These days people who own vintage and classic cars can join the "Blue Train Challenge", a six day event from Deauville to Cannes. This year there was a scheduled stop at Angles sur l'Anglin, so on Sunday I collected Pauline in Célestine and we wandered off to see what was happening. 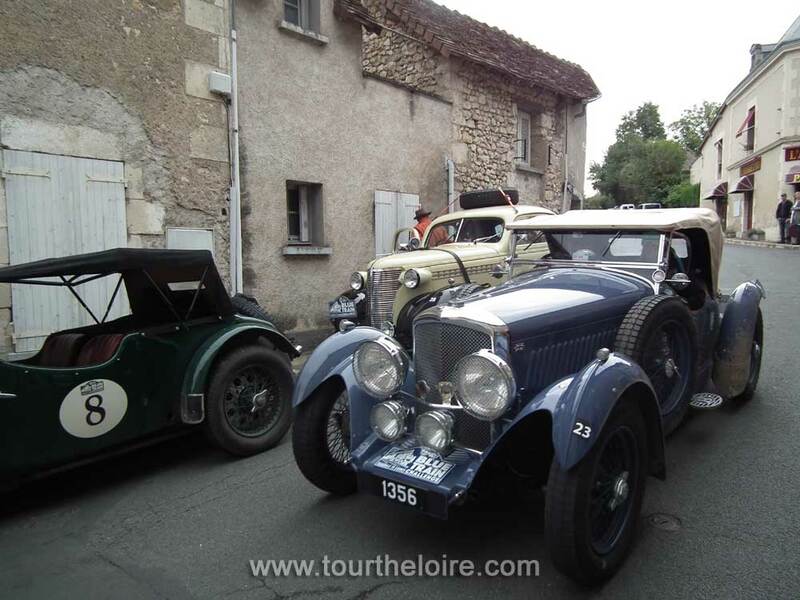 No23 is a 1937 Bentley Derby Open Tourer and No8 is a 1932 Alvis Speed 20. 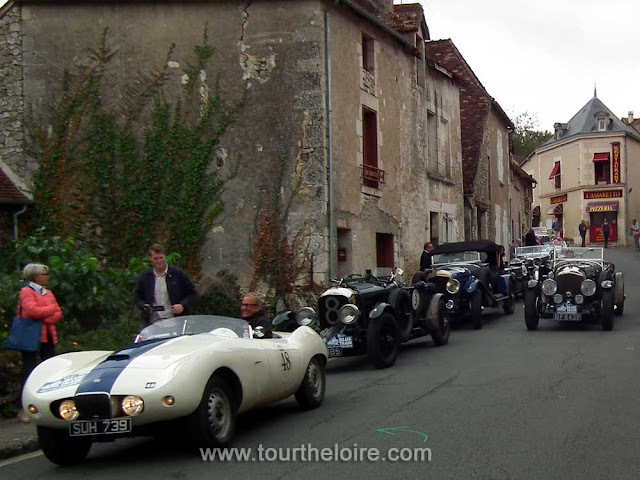 There was lots of cars (and spectators) and although Célestine isn't exactly a vintage GT machine people were just as happy to see us as they were to see the Bentleys, Alvises, Aston Martins, and a bevy of other 1930's, 40's and 50's exotica. A full list of runners and riders is here. 18 months ago Susan wrote "A Greenway to Replace the Railway". A meeting was held about 12 months ago to discuss the project; specifications, financing and the like, at which number of options were put forwards. 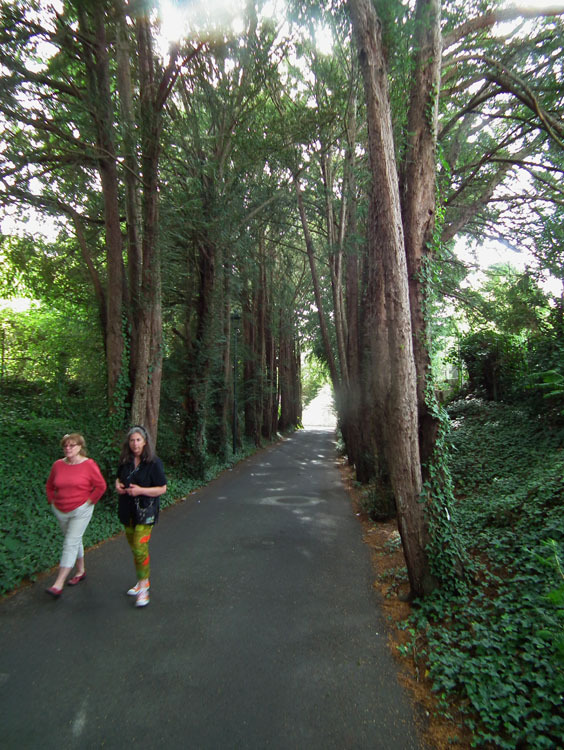 I don't know which option has been taken - either 2 metres wide, pedestrian only, or 3 metres wide pedestrians, bikes horses and skaters, but I do know work has started. I hadn't heard anything further on the project since last October, but I met TimB and Gaynor for a walk last Friday in Chaumussay and was rather surprised. I will have to keep my eyes open - I hope there will be some sort of announcement about the opening, but you can't take these things for granted. On Wild Carrot Daucus carotta in our vegetable garden October 2016. 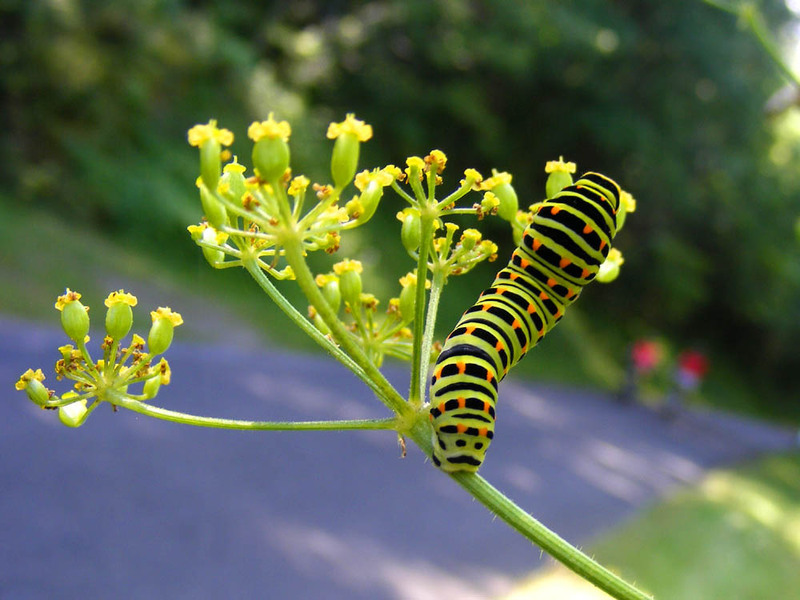 On the roadside above the Claise near Chaumussay, on Wild Parsnip Pastinaca sativa, September 2013. In our garden on Wild Carrot, September 2014. On French Hog's-fennel Peucedanum gallica, on a forest ride near Luzé, September 2012. On Wild Carrot in our orchard, September 2015. 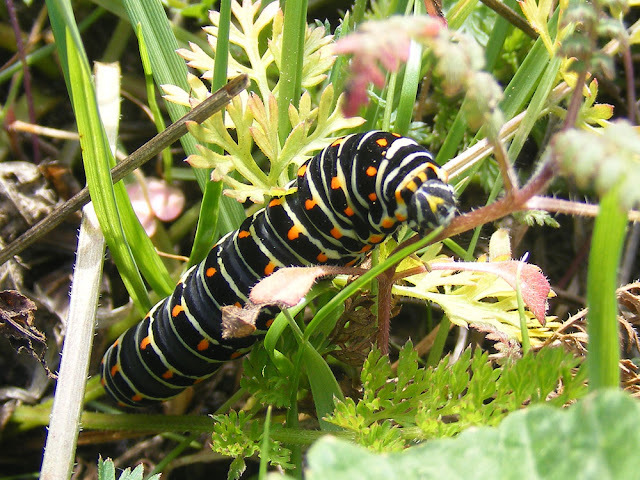 Caterpillars of the Eurasian Swallowtail Papilio machaon (Fr. 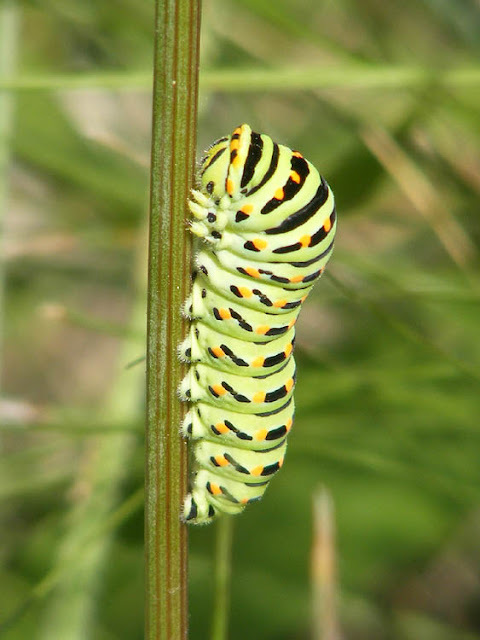 Machaon) can be observed on their food plants in September. 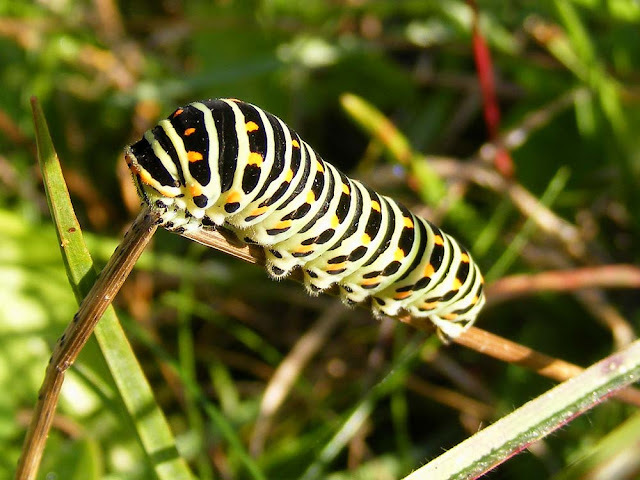 They are busy fattening themselves up before winter, which they will spend as chrysalises, having wrapped themselves up before the cold weather hits. They will leave their food plant and move to a sturdy upright stem where they will attach themselves and make a chrysalis. 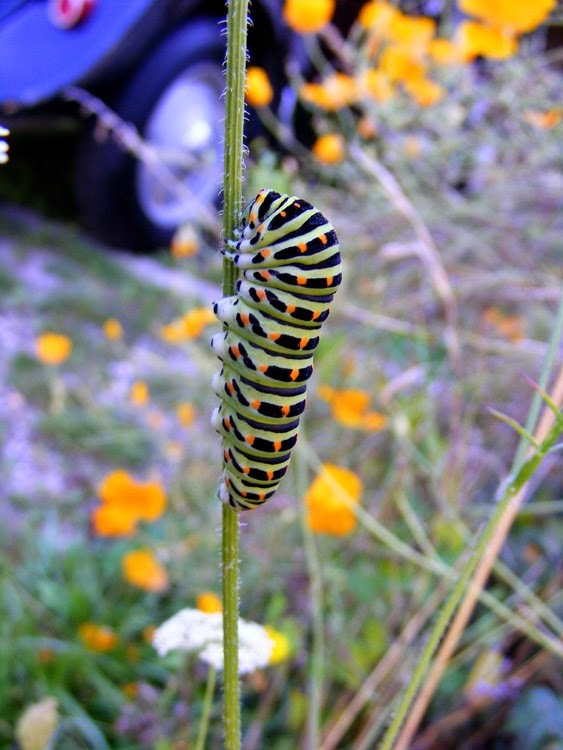 Depending on the surrounding vegetation the chrysalis could be green or brown, to blend in. The problem was electricity - with the headlights on she was drinking it like it was going out of style, and she wasn't recharging the battery. This means that by the time I got home 75 minutes later the headlights were little more than glow worms in a tin, and once the motor was off that was it - she wasn't going anywhere. Which was peeving, because I had plans. Anyway - a day on the charger later (yesterday), Tim and Gaynor arrived to go to the Bouchonne de Ste Maure with us, and this time Celestine behaved impeccably. Yes, it rained, yes there were probably less cars than there could have been, and yes, many people didn't stay to picnic on the road (we did). So now I have to sort out Célestine's electrics. I have a suspicion the battery isnt good.